QUESTION: Mr. Armstrong; I cannot tell you how much I respect your work and your computer. It is so obvious that you have been correct on every market. Even last year at the WEC you warned that interest rates would continue to rise and the stock market would not Crash and Burn. My hat is off to you. My question is we are approaching that number —— you gave at the WEC for the breakout in interest rates. We should expect rates to rise despite the fact that Trump has said the Fed is raising rates too fast? ANSWER: Everything is connected. 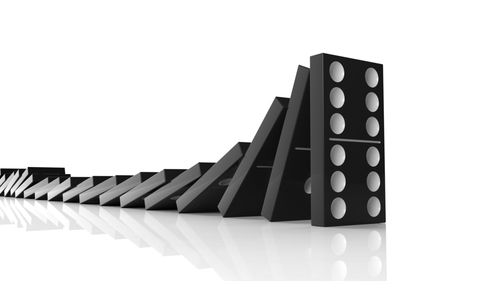 You push on one domino and its forces all the others to fall in their time and place. This is the difference between a domestic analyst who forecasts based upon his opinion and a global perspective that is shaped by trends. Treasury 10-year yields rose the most since February as stronger US economic data added to the case for reduced stimulus measures from the Federal Reserve. Trump’s tax breaks, despite what the Democrats say, are the reason behind the strength in the economy. In fact, a correlation of tax decreases with economic activity increases in growth is 100% spot on. Raise taxes and people have less to spend and then economic growth declines. It does not take a Nobel Prize to figure that one out. Emerging-market stocks have tumbled 4.5% in the five days last week, which was their worst performance since February. The dollar has rallied despite everyone saying it was crash. Let me make this perfectly clear: The dollar’s rally will continue overall. The Fed will continue its policy of gradual interest-rate increases at least through the end of 2019 and probably into 2020. Meanwhile, the rise in US rates will FIRST cause tremendous problems in Emerging Markets and then in Europe, followed by Japan. There is no getting away from this trend.